An awful lot of fun can be had with a few simple bits and pieces. The important thing is to dress up your booth or stall nicely. Putting someone in charge who has a good bit of patter is another way to stoke up interest and get people queuing up to have a go. 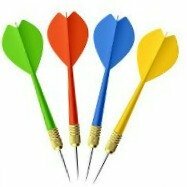 Below are some easy fete games that use darts. You've probably seen some of these at the fairground. Now its your turn to be showman for the day! Obviously if you are setting up booths that involve darts keep things safe. Many fairground booths throw to the floor not wall to avoid accidents. A good wooden board backdrop is required behind the targets whether on the wall or floor. All these fundraisers can be made easier or more difficult depending on the ability or age of the likely contestants. It is also possible to run a children's version of an adult fundraiser alongside each other. Playing cards are fixed to the wooden board. Contestants have to score exactly 21 in 3 darts. Picture cards score 10. Aces of course can be 1 or 11. Bank notes are fixed to the wooden board. The notes are visually appealing and encourage take up. You may be able to get away with colour photocopies cut to size. Put a small round sticker about the size of a penny on each note. Anyone who lands a dart in the sticker wins the banknote. Use spare notes for the payout. Raffle tickets are fixed to the wooden board. Their numbers correspond to those on an array of prizes. Stick a raffle ticket to win that prize. You can also make up a version of this with sweet wrappers. Land a dart in a wrapper to win that chocolate bar as a prize. You will probably need to trim the wrappers down to prevent this being too easy. A traditional dartboard is attached to the wooden board. 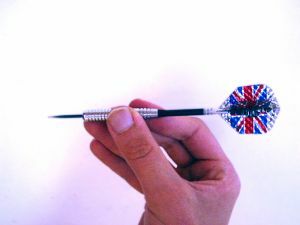 Can you hit the bullseye in 3 darts? 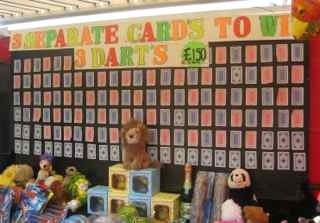 Hopefully these darts based fundraisers have shown you how easy it is to turn something simple into a winning money-maker. There are lots of other easy fete ideas on our Fetes and Fairs pages.